Though Forecast Is Tricky, Northeast Could Face Record-Breaking Snow Storm : The Two-Way The National Weather Service says that some parts of New England could end up with more than two feet of snow, this weekend. But this, they warn, is a difficult forecast. 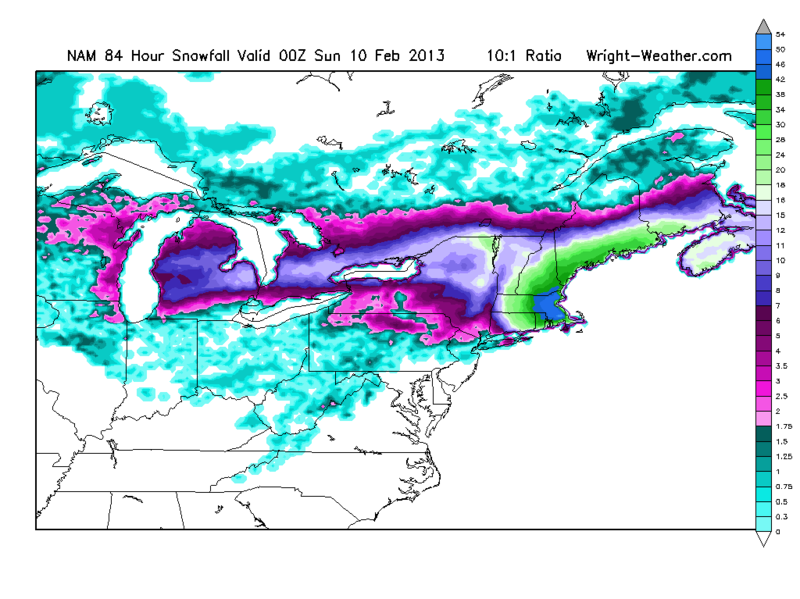 The NAM model shows one of the more severe resolutions, with up to 50 inches of snow in some parts of New England. "The tough forecast hinges on the interactions between a small system currently near Chicago and another that hasn't even formed yet off the Carolina coast. Should the storms merge and pool their energy, a rapidly deepening snowstorm could develop on Friday. If they miss each other — even by 50 miles — most of the resulting storm's energy will be shifted further northward, leaving primarily rain for New York City." That means that cities like Boston and Bangor, Maine will likely get hit very hard. The National Weather service says that come Friday travel will likely be nightmare and the storm could dump up two feet of snow in some parts of Massachusetts. "Snow will fall at a rate of 2 to 3 inches per hour Friday night into early Saturday, according to the weather service. "Residents are encouraged to prepare for possible power outages across the region as winds could gust up to 60 mph, according to the National Weather Service." The Weather Channel's Jim Cantore has been tweeting different model runs this afternoon. The GFS, which Cantore says is "more realistic" gives Boston 16 inches and New York about six inches. The NAM comes to a more severe resolution, giving parts of New England up to 50 inches of snow. The National Weather Service has now issued a blizzard watch for Boston. They are now forecasting 18 to 24 inches of snow for big part of Massachusetts, northern Connecticut, Rhode Island and southern New Hampshire.